Kids Can Press has put out some rather interesting titles for the fall. I've never seen anything quite like them. They are well-over the Bookworm heads but I've gotten a snicker out of them myself and so I present them mostly to the adults in our audience. 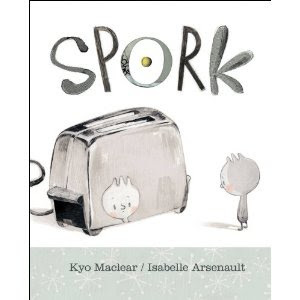 First off, there's Spork , by Kyo Maclear. Spork, as you might sympathize is neither spoon nor fork. He's having a hard time fitting in. He doesn't know where he belongs. When he puts on a bowler hat, the other forks think he is too round. When Spork makes a paper crown and wears it on his head, the spoons think he looks too forkish. Sigh. What's a Spork to do? Eventually he does find his use in silverware society but it's a hard fought battle. There is one page spread that makes a bit of a political statement in accepting all sorts of people, but generally the book is all about amusing one's self with the concept of a spork. It produced a snicker. Or two. Or possibly three. Illustrated by Isabelle Arsenault in silver/gray tones, it captures the idea of a silverware society quite well, I think. Enjoyable all around (if I don't let myself think too hard about the political statement.) Truth is - I MIGHT be thinking too hard about it. This book makes fun of tabloids, pure and simple. It tells the story of a boy who accompanies his dad to work one day. His dad is a reporter for the Daily Comet which covers all sorts of fantastical, and simply quite unbelievable things. As he trots along after his father, he notices all kinds of bewildering things going on around him. Does the tabloid cover truth or fiction? Is his dad for real or what? 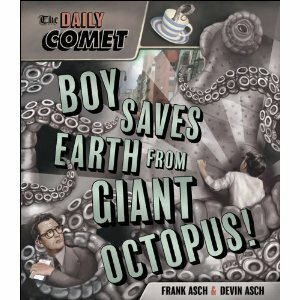 Ultimately, of course, the headline reads Boy Saves Earth from Giant Octopus! Do you believe it, or don't you? Well, if Elvis himself makes an appearance, it has to be truth, isn't that right? On each page there is a picture to illustrate an idiom, from "more fun than a barrel of monkeys" to getting "ducks in a row." At the end of the book there is an explanation as to what each of the idioms mean. If you have a literal child (like I do) then this book can actually come in quite handy! Not to mention, have I mentioned that it's beautiful to look at? And that there are cats I cannot find?!?! Definitely a thumbs up for The Cat's Pajamas if you can find yourself a copy. Incredible, incredible book! So there you have it, my friends! Some interesting and odd picture books, the likes of which I'm not at all certain have been seen before. It's definitely out of the ordinary! Thanks, Kids Can Press, for allowing me a look-see and for making the octopus a giant one. Hilarious that you did this -- because I am also going to feature 2 of those 3 books as "unusual books from Kids Can Press" in a couple of weeks. Kyle LOVED Spork -- like that was the book he reached for from the pile! 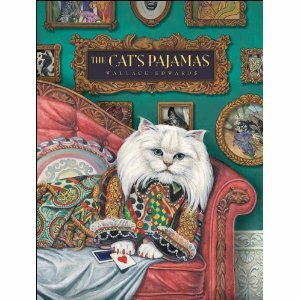 The Cat's Pajamas sounds like fun! I have a VERY literal child so I'm sure we would enjoy it.